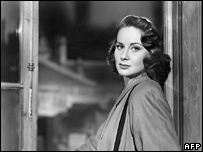 Italian actress Alida Valli, who starred in films by Alfred Hitchcock and Luchino Visconti, has died at the age of 84. She made her cinema debut at the age of 15 and appeared in over 100 films. They included Hitchcock's The Paradine Case (1947) with Gregory Peck, The Miracle of the Bells (1948) and Carole Reed's classic The Third Man (1949). Italian President Carlo Azeglio Ciampi said her passing was "a great loss for Italian cinema, theatre and culture". Rome's Mayor Walter Veltroni praised her "incredible talent" and said Italy had "lost one of its most beautiful faces". Born Alida Maria Laura von Altenburger in 1921 in Pola, now Pula in Croatia. She was discovered by US producer David Selznick, who awarded her a film contract thinking he had found a new Ingrid Bergman. Her English-speaking career did not last long because of her thick accent, but she continued to act in Italian and French films, as well as theatre. Valli won Italy's top David film prize in 1982 for a supporting role in Marco Tullio Giordana's La Caduta degli Angeli Ribelli and another for her career in 1991. She was awarded a Golden Lion at the Venice Film festival in 1997 for her contribution to Italian cinema. Her funeral will take place in Rome's city hall on Monday.